Dog lovers enjoy watching their canine companions romp and play outdoors, and dog parks are the ideal place to let pups socialize in a safe environment. Yet, these parks can vary significantly in their levels of safety and the amenities that are offered to the visitors. As you plan your community project, keep these qualities of a great dog park in mind so that you can create one that appeals to dogs of all breeds and sizes, as well as to their human owners. One of the biggest benefits of a dog park is knowing that your pet can run around with no leash and in a safe space. Begin your planning by making sure to choose appropriate fencing materials that are tall enough so dogs can’t jump over it and that don’t contain large gaps that smaller dogs could squeeze through. Then, explore how custom entrance gates can turn this safety feature into an impressive welcome that everyone loves walking through when they visit the park. Ideally, your dog park should have two separate play areas to give small and large dogs their own areas to play in without hurting each other. Often, pet owners will use the smaller area to condition their puppy to being around other dogs, and the larger area is perfect for rambunctious or large breeds to burn off their energy. Keep in mind that both areas should have similar equipment and amenities so that everyone is satisfied with their side of the playground. Dog parks should have surfaces that are soft on canine paws yet still hygienic. Although natural grass is a common surface used in dog parks, it is susceptible to damage from dogs digging and running through the grass on a regular basis. For this reason, synthetic turf is an option that offers more durability, and the park maintenance crew can spray it down regularly to remove dog waste or mud so that the playground remains clean. Turf installation can also include adding other materials such as engineered wood fiber to the park to create designated sections for play. Dog park equipment should encourage canines to try things they cannot do at home. For instance, a dog teeter totter encourages pets to test their balance, and hoop jumps get pups to leap through the air for fun. 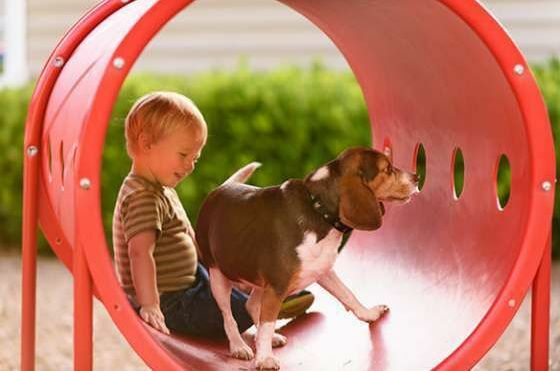 Dog park equipment, such as agility courses, also encourage humans at the park to get up and interact with their canine friends so everyone gets involved in the play. Pet owners are more likely to follow proper park etiquette if you include trash bins where they can deposit their dog’s waste or other refuse. Make sure to set these up near other places where humans will gather such as on benches that are located near the shade. A leash post is another amenity that park visitors appreciate as they get their dog ready to play or head home. Every community should have a dog park where people can gather and enjoy socializing with other pet owners. Now that you know the top qualities of a great dog park, you can get started on picking out the features that make yours stand out from the rest.